CHICAGO, Illinois (CNN) -- More than 30 years ago, William Ayers was a fugitive leader of the Weather Underground, an antiwar terrorist group known for its bombings of police stations, the Pentagon and the U.S. Capitol. 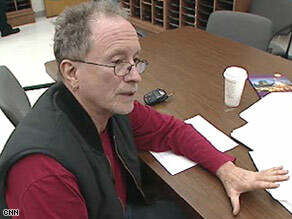 Chicago gave William Ayers its Citizen of the Year award in 1997 for his work on an education project. Today, he is back in the news, a central figure in a debate over character, judgment and associations in an increasingly bitter presidential race between Democratic Sen. Barack Obama and Republican Sen. John McCain. At issue is Obama's relationship with Ayers, an unrepentant radical who as late as 2001 said he wished he had done more to stop the Vietnam War. After years on the run, the federal government's case against Ayers and his wife, fellow radical Bernadine Dohrn, was thrown out due to illegal wiretaps and prosecutorial misconduct. CNN's attempts to contact Ayers for comment were unsuccessful. Ayers is now a university professor who lives on the South Side of Chicago, where Obama cut his political teeth. The nature of their relationship has been the subject of discussion all year in the blogosphere, but was dismissed by Obama during a Democratic primary debate earlier this year. Obama confirmed during that April debate that he knew Ayers "as a guy who lives in my neighborhood." When pressed, Obama said they served on a charitable board together. He also denounced Ayers' support for violence. "What they are arguing is that somehow the fact that these two people, who both served as educational reformers in Chicago, both who did have their paths cross professionally as well as neighbors occasionally, that somehow this association is a problem because of Bill Ayers' past and things that happened in the 1960s when Barack Obama was 7 years old," said Anita Dunn, a senior Obama adviser. "And that's just wrong and quite unfair." But the relationship between Obama and Ayers went deeper, ran longer and was more political than Obama -- and his surrogates -- have revealed, documents and interviews show. A review of board minutes and records by CNN show Obama crossed paths repeatedly with Ayers at board meetings of the Annenberg Challenge Project. The Annenberg Foundation gave the project a $50 million grant to match local private funds to improve schools, and Ayers fought to bring the grant to Chicago, according to participants and project records. The project's organizing committee asked Obama to serve as the board chairman in 1995. Annenberg Project Executive Director Ken Rollings said Ayers was not a member of that ad hoc group when the decision was made. For seven years, Ayers and Obama -- among many others -- worked on funding for education projects, including some projects advocated by Ayers. "The specific job of the board of directors was to give out the money," said Stanley Kurtz, a conservative researcher for the Ethics and Public Policy Center and frequent Obama critic. "Instead of giving money directly to schools, they gave money to what they call external partners and these partners were often pretty radical community organizer groups," said Kurtz, who also has been reviewing the Annenberg Challenge's recently released records. The board, for example, gave hundreds of thousands of dollars to Bill Ayers' small schools project. The project promoted alternative education, including projects like the Peace School -- where the curriculum centered on a United Nations theme -- and another school where the focus was African-American studies. The funding, according to Kurtz and records CNN reviewed, came directly from the Annenberg foundation which Obama chaired. The project shut down in 2003 after achieving "little impact on school improvement and student outcomes," its final report stated. While working on the Annenberg project, Obama and Ayers also served together on a second charitable foundation, the Woods Fund. It was that foundation that Obama referenced in the debate -- not the Annenberg Challenge. Among Wood Foundation recipients were the Rev. Jeremiah Wright's Trinity United Church, where Obama attended and was married; and the Children and Family Justice Center, where Ayers' wife Dohrn was director. Ayers has strong defenders in Chicago -- including Mayor Richard Daley, who called him "a valued member of the Chicago community." The city gave Ayers its Citizen of the Year award in 1997 for his work on the Annenberg project. For Obama, the chairmanship of the $100 million Annenberg board helped vault him from a South Side lawyer to political player. And there, too, is an Ayers connection. In 1995, months after the little-known Obama became Annenberg chairman, state Sen. Alice Palmer introduced the young lawyer as her political heir apparent. The introduction was made over coffee at the home of Ayers and Dohrn. Two people who attended the event told CNN the introduction of Obama included a solicitation for campaign funds. Obama senior aide Dunn said it was just a coincidence the event occurred at the home of the two former Weather Underground members. "A Democrat state senator organizes the meeting at the home of one of her supporters," Dunn said. "What is the problem here? It is the worst kind of inference and the worst kind of politics to say that says something about Barack Obama." Palmer rarely speaks to reporters. But she recently denied to CNN that she organized the political affair for Obama, although she said she attended. Dr. Quentin Young, a longtime physician, now retired, referred to the gathering as the political coming-out party for Obama. Young said it was a small group -- maybe a dozen or so people -- who were being introduced to the next senator from Chicago's South Side, and that money was raised for Obama at the event. Sunday, senior Obama strategist David Axlerod told CNN that Obama "didn't know the history" of Ayers' notorious past when the political event was held. Ayers' past has been well-chronicled and well-known in Chicago. His late father Thomas, a wealthy and prominent executive of the public utility Commonwealth Edison, worked tirelessly and publicly to re-establish his son into Chicago society. But the Obama-Ayers connection exploded into the national news Saturday when McCain's running mate, Alaska Gov. Sarah Palin, accused Obama of "palling around" with a domestic terrorist. The Obama campaign calls the charge "ludicrous," and there is no evidence to show the two men are pals -- although in an interview earlier this year with Politico, Axlerod said the two men were friendly. Obama and Ayers had a connection not just through the education and charity boards, but in the area of juvenile justice. Obama praised Ayers' book on the subject in a 1997 Chicago Tribune review, calling it "a searing and timely account of the juvenile court system, and the courageous individuals who rescue hope from despair." In an event organized by Obama's wife Michelle, then-Illinois state Sen. Obama was listed as a panelist along with Ayers on a discussion involving juvenile justice issues. At the time, Obama was fighting legislation that would put more juveniles under the purview of adult courts.